In this digital age, information is king. 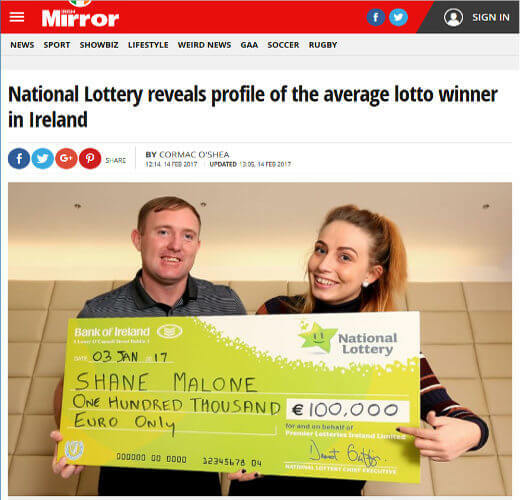 Maybe that’s why the National Lottery has just released data on the average profile of Irish people who win the lottery. It seems like 7 f 10 winners in 2016 were male. Does this mean that males are more lucky, or that more males play the lottery? Another bit of information says that 7 of 10 Irish winners were aged 45 or over. Maybe seniors have more money to play or just more time on their hands to play the lottery. Interestingly only 4 in 10 of the winners said the first person they told is their life partner. And 20% of the winners were so fearful they slept with the winning tickets under their pillow. Most Irish winners were from Dublin, and 25% of them were drivers. While the most popular way to celebrate a win is a pint, a full 47% want to head to the Caribbean or some other beach in warmer climes.